4Videosoft DVD to iPad Converter for mac is the best Mac DVD to iPad Converter, so you can use it to convert DVD to iPad Mac compatible MP4, H.264, MOV, M4V, MP3, AAC, M4A, etc. conveniently. 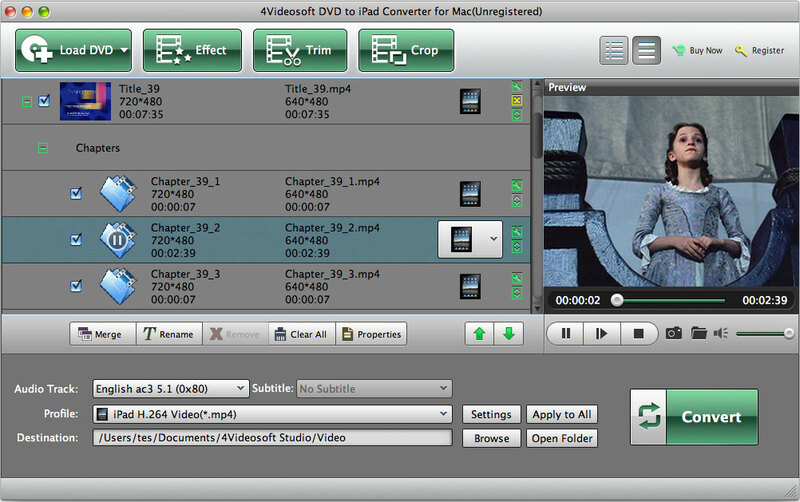 Moreover, 4Videosoft DVD to iPad Converter for Mac has some versatile DVD video editing functions, such as modifing video effect, trimming video length, cropping video frame, merging video segments, and adding video watermark. ...... 1 channel audio track, supports outputting video without audio track, supports adjusting output file volume, improves the "Merge" and "Zoom Mode" function. 4Videosoft DVD to iPad converter for Mac is fully compatible with Mac OS X, supporting Leopard and Tiger, which work well with either Power PC or Intel processors. Also it is capable of converting any DVD movies to iPad compatible video and audio formats on Mac. Plus, it totally supports iPad, iPhone, iPhone 3G, iPod, iPod Classic, iPod Nano 4, iPod touch 2 and Apple TV. 4Videosoft DVD to iPad Converter for Mac can remove the black borders of DVD movies for you to watch it in full screen on your iPad. Merge all titles and chapters into one output file, then you can enjoy a long movie on your iPad without interruption . Qweas is providing links to 4Videosoft DVD to iPad Converter for Mac 6.3.32 as a courtesy, and makes no representations regarding 4Videosoft DVD to iPad Converter for Mac or any other applications or any information related thereto. Any questions, complaints or claims regarding this application 4Videosoft DVD to iPad Converter for Mac 6.3.32 must be directed to the appropriate software vendor. You may click the publisher link of 4Videosoft DVD to iPad Converter for Mac on the top of this page to get more details about the vendor.